"The DUALXDirect provides two independent high quality active interfaces that let you connect instrument, line, or speaker level signals to a mixer or other balanced inputs. Each of the high impedance 1/4" and XLR inputs (provided via "combo" jacks) are buffered and converted by very low noise active electronics into an isolated, balanced, low impedance signal output. 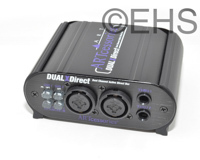 The DUALXDirect has an extremely flat and wide frequency response and can handle high signal levels. This gives the DUALXDirect a very clean and neutral sound with a wide variety of signal sources and over long signal runs in high noise environments.